Literacy to Life is a seven-week in school creative writing residency in which third graders learn the foundations of creative writing through arts-integrated teaching designed to motivate students and improve their writing skills. At the end of the seven weeks, professional actors known as the Paramount Story Wranglers transform students’ writings from page to stage in a musical, sketch comedy, variety show for the entire campus! Let’s make this happen for more students. Support Literacy to Life today. Once Upon A Time there was a mysterious town with no signs and a guy named Steve (spelled XYRTVY) who loved turtles who lived there. He desperately needed a pet turtle because he adored turtles. But there was a problem because he could never locate the pet store because there were no signs in the town. Then XYRTVY runs to his best friend Marg the Magical Witch who makes City Hall appear so he can complain to the government! Ever Since That Day, XYRTVY was successful because the government got rid of the laws for no sings in the town and he wrote 5000 children’s books about turtles. The End. Once upon a time there was a stinky fish man who liked to pick roses and hang out on a fisherman’s dock that smelled like tuna! He was really kind and grabbed flowers to save for catwoman. He wanted to marry catwoman because he loved cats and how fluffy they were, even though they attacked him. But he was afraid catwoman would gobble him up because he was part fish and he was the biggest fish! Then he dressed up as Justin Bieber in a disguise so catwoman wouldn’t eat him and they could get married. And ever since that day he was known as Justin Bieber, he married catwoman, gave her the roses, and they lived happily ever after. Once upon a time, Benjamin Franklin was on the Titanic to explore Africa. He wanted silver and gold because he wanted to be rich and popular. But the lightning has it all because everything it touches turns to gold and the lightning won’t share. Then he flies a kite with a key on it and when the lightning strikes it, all the rain turns to gold. And ever since that day, he was rich with 1000 gold coins and he bought a mansion. The End. Once upon a time there was Taco Pony who was shaped like a taco and also sold tacos in Vegas. She had Billions from selling tacos, so she wanted to buy new toys and a new castle from the secret toy room behind the Bellagio Fountain. But, when she went to the secret room it had disappeared. The room had exploded. Then, she tried so hard to find the pieces and build it back together again, but she failed. Then a magic man who can fix everything built it back together for her. Ever since that day she had a toy and a taco castle and she was excited. The End. Once upon a time, Lizzo the lizard was speed walking on Lizard Lane. He wanted a tail because he looked it up online and thought it looked beautiful and would make him look like his favorite animal- a cheetah. But he has to change his color to blue like sky and water because only blue things can grow tails. Then he touched the computer screen and turned that color because he has the ability to change color when he touches things. And ever since that day, he was blue and grew a tail. The End. Once upon a time, Lil’ Fluffy Unicorn lived in Center Park Spectacular. She wanted a best friend to play hopscotch with because she was bored. But, she was always singing, “Lil’ Fluffy Unicorn, Dancing on the Rainbow” and everybody called her annoying because it bothered them. Then she felt worried and sad. She went to a haunted house to feel happy and she met Mr. Gump, who was there too because he was sad. He also liked to sing. Ever since that day they played hop scotch together and sang together. The End. Once upon a time, there lived a magical Man Fairy and his home was an underground bunion store that had a secret passage to the Candy Dump where he hung out a lot. He wanted the plastic super crown and plastic super wand from the magical children who lived in the dump, which would give him the power to rule the fairies and prove to the girl fairies that boys could be fairies. But his boss (and his older sister) the Tooth Fairy wouldn’t let him because she wanted to prove only girls could be fairies and if she did let him their mom would ground her. Then Man Fairy are all the candy in the dampened got sick because his older sister never let him eat with her. The candy was magical and the crown and wand were hidden in a candy bar called “Magical Candy”. Ever since that day he played with all the magical children because he freed all the children who were drowning in candy. The End. Once upon a time, Mr Boat lived in Witchaboo Lago-the most gigantic lake in the world. He wanted to be beautiful because he was hairy and stinky and hideous because he was cursed for polluting the water. But every time he shaved, his hair grew back with even more. Then a beautiful boat sails up and gives him beauty tips. Once upon a time, there was a pirate parrot named Georgie. He was practicing for the annual gold finding contest on Pirate Island. Georgie wanted to find the gold and win the contest because he wanted the prize of 200 crackers. He asked his 3 friends, Lego Pirate, Pirate Patty and Patcheye to help. But the island they were on was too tiny, so they couldn’t find the treasure. They thought it was on a bigger island. They they went to a bigger island on their ship. They dug super deep and found the BIG treasure, a chest full of gold. Ever since that day, they shared the gold and snacked on crackers like every single day. The End. Once upon a time, there was Underground Rail Man in Dance Space. He wanted $2,300 to go to a dance class for his wedding to Rail Road Girl in outer space. But he needed a dance partner, money and a DJ. He couldn’t use his computer because it was completely out of order. Then he fractured his railroad ribs while dancing and he called the Ambulance that Cheto Boy was driving. He spent all his money repairing his ribs so he couldn’t afford the dance class. So Cheto Boy became his dance partner and let him use his computer and taught him the Ciro Dance for free. And ever since that day, he danced on the magical, colorful floor at his wedding. The End. Once upon a time there was a singing mushroom living in a painting in a famous museum called the Singing Art Museum (SAM). It wants to be the most famous singer of all the wide world, because the mushroom wanted the most money. But the mushroom’s voice was so squeaky, it’s scared of it’s own voice. Then a fairy came and granted the mushroom three wishes. She can grant all the wishes, except for the wishes that the mushroom truly wants: a good voice, to be rich and famous. She can’t grant those wishes unless he climbs EVER AFTER MOUNTAIN. The mushroom climbed the mountain, which took nearly a year, and ever since that day his wishes were granted. The End. Once upon a time, Mr. Miguel was going to buy chips at the store called “Chilli Cheese House.” He needed chilli and cheese for his chips, but he didn’t have any money. Then his friends Nachilla and CheeseMan gave him money because they wanted him to bring a snack for their Super Bowl Party. And ever since that day, he mixed the ingredients together and said, “It’s a dip AND a chip! Let’s call it nachos!” and he poured the dip on top of the chips. The friends celebrated with nachos at the Super Bowl Party. The End. Literacy to Life is a school-based literacy program for third graders that uses the theatre to transform students’ understanding and approach to writing. Our professional teaching artists, the Paramount Story Wranglers, use creative writing, improvisation, and role-playing activities to improve students’ writing skills, all while developing their confidence, creativity, and storytelling abilities. For seven weeks, students write individual and group stories using the Literacy to Life curriculum. 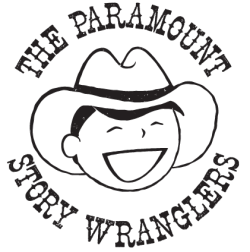 Then, the Paramount Story Wranglers collect student stories, adapting them into a full-length sketch production that they perform for the entire school.